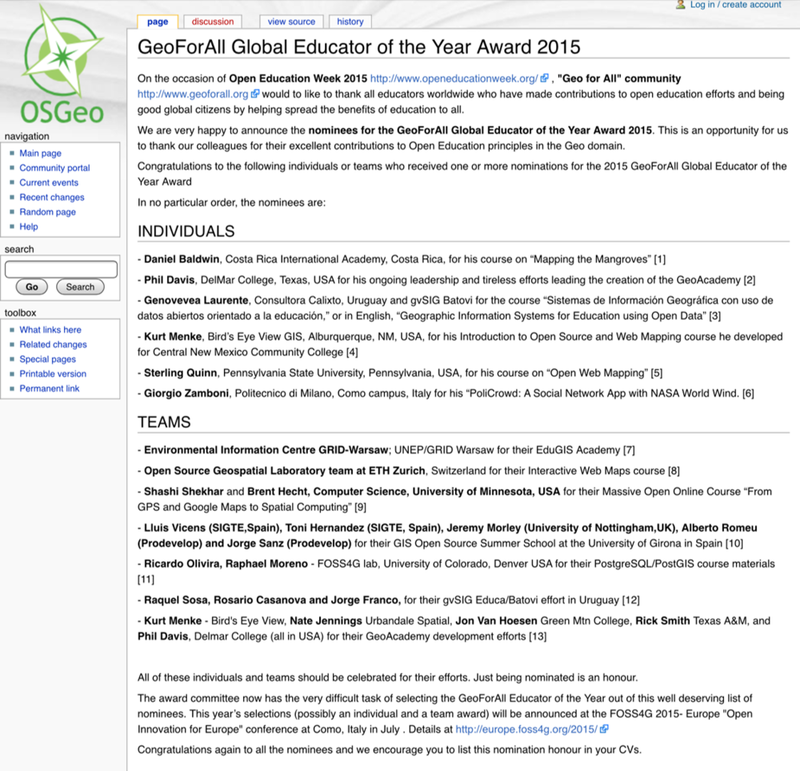 Geo For All Announces Nominations for Global Educator of the Year! Announcement: Learn the new QGIS 2.8.1! The GeoAcademy is pleased to announce the launch of their new Introduction to Geospatial Technology Curriculum. The curriculum will be based on the latest version of QGIS, version 2.8.1 Wien which is a long term release (LTR). The curriculum is a complete package of five GIS courses leading to a Certificate of Proficiency in QGIS from the Del Mar College continuing education program. The five courses will be offered in a limited-enrollment online class format (25 students maximum), taught by leading GIS professional educators (GISP & PhD) who created the course material. I am one of the instructors. The courses were developed via the National Information Security and Geospatial Technologies Consortium (NISGTC), under the leadership ofPhil Davis (Del Mar College). Kurt Menke(Bird’s Eye View), andDr. Richard Smith(Texas A & M – Corpus Christi), authored the material which includes: theory, lecture, labs, data and task oriented video tutorials for each lab exercise. 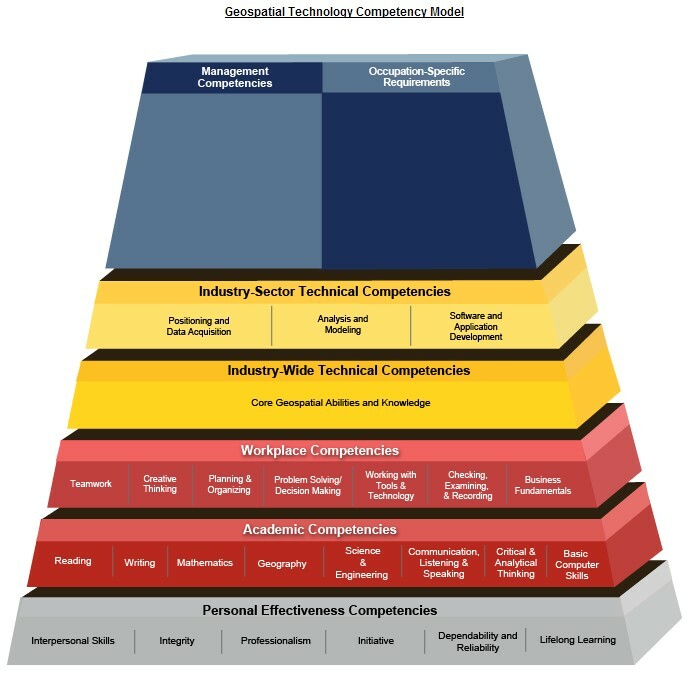 The courses are aligned with the Department of LaborsGeospatial Technology Competency Model(GTCM). The GTCM was published in 2010 and will be revised in 2015. It describes the complete set of knowledge, skills, and abilities required by GIS professionals. It is designed around a hierarchical tiered model of knowledge and promotes use of open source technology. QGIS is the featured software for all courses. When appropriate other FOSS software’s are also included such as GRASS and InkScape. The vast majority of US based colleges and universities use a single vendor’s proprietary GIS software, making this series of courses very unique. In fact it is the first national attempt at a completely open source GIS curriculum. By their very nature of open source software, there is no marketing engine promoting them. This has slowed the adoption and overall use of open source GIS. One hope is that this material will entice people to learn about FOSS4G. Bird's Eye View will be offering instructor led online versions of these courses in the near future. The courses are available online at theFOSS4G Academy. Over 2,500 students have already enrolled for these courses demonstrating how in demand these materials are. Visit the FOSS4G Academy now and explore the material! This fall Bird's Eye View (with the support of the GeoTech Center) will be holding the FOSS4G Workshop for Educatorsat the Free and Open Source Software for Geospatial Conference (FOSS4G) in Denver, Colorado. This is exciting for at least two reasons. Having the FOSS4G Conference in North America, let alone the United States, is fairly uncommon. In recent years it has been held in Australia, South Africa and Spain. 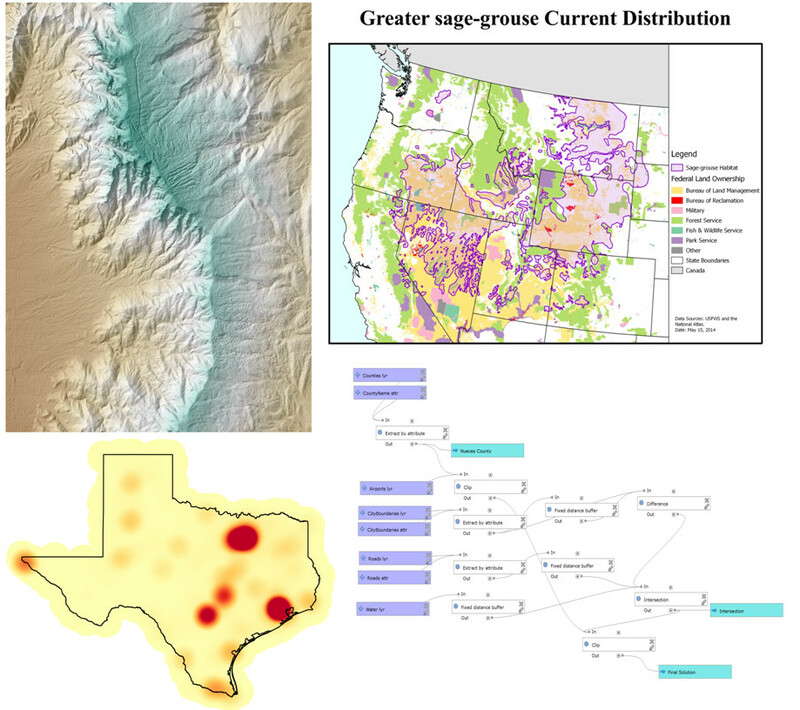 Secondly, the workshop will premier one of the only FOSS GIS curricula in the United States. Entitled Introduction to Open Source GIS and Web Mapping, it is currently being taught at Central New Mexico Community College. Free and open source software comprises one of the fastest evolving sectors of GIS. While FOSS GIS software has been around since the 1980's, recent years have seen the software becoming much more mature and user friendly. There are great FOSS GIS products for the desktop, web server, web client, spatial database and mobile GIS. Historically, ease of access and installation has been a major hurdle for those wanting to transition to FOSS GIS software. Now there are intuitive Windows installers for all the leading packages. The course is expected to become increasingly important to the CNM program. In New Mexico, employers are starting to favor applicants with knowledge of both ESRI and FOSS applications. This is in part due to the economic times. Students at CNM and elsewhere learn GIS in pure ESRI environments. Most are shocked to discover how many capable FOSS GIS software packages exist. The course sticks to a pure FOSS paradigm. For example, assignments and lectures are provided in Open Office versus Microsoft Office. The students are not introduced to much new GIS material in the course, save web mapping. Rather they are shown how to do things they have learned in other foundational courses using FOSS GIS software. The packages used include: Quantum GIS, GRASS GIS, GDAL/OGR, SpatiaLite, PostgreSQL/PostGIS, and MapServer. They are also introduced to open standards and open data. Midway through the semester they are given a final project assignment. For this they research a FOSS GIS package not being covered in the course lab, and during the last week of class they present their findings to the class. This exposes the students to a large number of new tools. The web mapping portion is an introduction to web mapping and the web in general. Part of the overall goal for the course is to make it accessible to students who have completed the Introduction to GIS course. So, this course has no programming requirement. Google maps (although no open source) is used as a gentle introduction to web mapping. Then students move on to labs where they use MapServer to create basic web mapping applications. The workshop this fall will target educators wanting to incorporate FOSS GIS into their curricula, or those who are just curious about what FOSS GIS is and what it can do. The course goals, readings, labs and exam structures will be shared. Attendees will also get to try their hand at a lab or two. For more information visit the conference workshop page.